(Nanowerk News) As an idea, the notion of an “artificial leaf” was always meant to be simple: Could scientists, using a handful of relatively cheap materials, harness the power of light to generate two powerful fuels — hydrogen and oxygen — by breaking apart water molecules? In practice, however, the idea faced a number of hurdles, including how to pattern the catalysts on silicon that would power the reaction. But that could soon change, says Patterson Rockwood Professor of Energy Daniel Nocera. 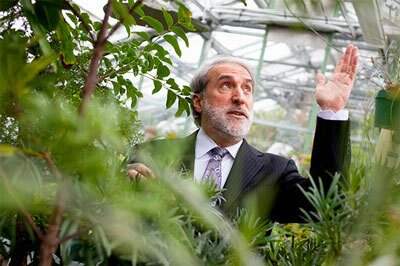 Patterson Rockwood Professor of Energy Daniel Nocera. Using an electro-chemical process similar to etching, Nocera and colleagues have developed a system of patterning that works in just minutes, as opposed to the weeks other techniques need. Dubbed reactive interface patterning promoted by lithographic electrochemistry, or RIPPLE, the process can be so tightly controlled that researchers can build photonic structures that control the light hitting the device and greatly increase its efficiency. The new system is described in two papers that appeared in recent weeks in the Journal of the American Chemical Society ("Facile, Rapid, and Large-Area Periodic Patterning of Semiconductor Substrates with Submicron Inorganic Structures") and the Proceedings of the National Academy of Sciences ("High-throughput patterning of photonic structures with tunable periodicity"). The project was one of seven research efforts supported in the inaugural year of Harvard President Drew Faust’s Climate Change Solutions Fund. The $20 million fund was created to spur the development of renewable energy solutions and speed the transition from fossil fuels. The ability to pattern catalysts — using cobalt phosphate to spur the creation of oxygen and a nickel-zinc alloy for hydrogen — on the silicon substrate is particularly important, Nocera said. Equally important, Nocera said, the system allows for fast patterning of relatively large areas — far larger than other systems that use nano-scale patterning techniques. Ironically, the discovery of the technique came about almost by accident. While the mechanism at work in the patterning isn’t fully understood, Nocera and colleagues can maintain precise control over the process and produce everything from patterns of lines to rings to squares on silicon substrates.